This is an extended EP that consists of a cool cover version (The opener is Kim Wilde’s song “Cambodia”), two new songs (exclusively recorded for this EP), 2 tracks taken from the sold out “Torch” 7” and 4 previously unreleased demo-songs. So this release seems to be meant as an appetizer for the next full-length album which should be previously released before the summer. 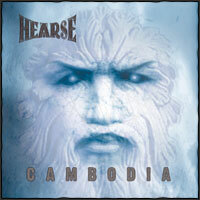 Hearse (which features Johan Liiva, ex-Arch Enemy on vocals) play a really cool sort of melodic death and roll, with many hints to classic heavy metal and a very accentuated and pretty dominant lead guitar. The sound of this recording is made very well, even the demo songs are not recorded really much worse than the rest of the cd. Everything has a good transparence and still lots of power. In fact this recording can be almost meant as a full length album, especially for those that didn't know the band until now. Most of the songs are held in midtempo, with some excursions in harder an faster death metal territories. All songs are carried by the really cool melodies of the lead guitar, sometimes more as pure leads, sometimes more as refrain almost singalong. In some parts Hearse remember me a little bit of Scheitan, but really only a little bit, because Hearse are more melodical, have more fantasy and lots more of changes and surprises in their music. A little bit of heavy metal here, a little bit of trash there, and a little bit of death metal (inclusive Corpsegrinder grunts) over there make of Cambodia a very interesting output and make me hope to listen to a band that will become bigger and important to the scene. The skills, the good and original ideas and last but not least the inspiration seem to belong to this band! I' m really looking forward to the full length album! !